Kwon Soojung is a dancer and choreographer based in Toronto. She has been dancing since the age of five. Drawing on her extensive traditional dance training, she is interested in creating original works of 'contemporary-Korean' dance. She is also dedicated to re-interpreting traditional dance genres. She has performed across Ontario and her works have been presented at the CanAsian Dance Festival and the Toronto International Dance Festival. She is also a member of the JM Dance Ensemble, a cooperative Korean dance group. Dedicated to the creation of new musical compositions to accompany her dance, she has collaborated with Korean drum ensemble Jeng Yi and The Opaque Ensemble. 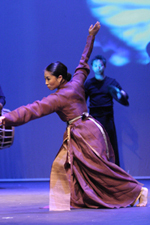 Her 2005 work 'Choonengmu', commissioned by the CanAsian Dance Festival, won the Dora Mavor Moore Award for 'Outstanding Sound Design/Composition' in the Dance Division.